We’ve recently seen a dramatic increase in the popularity of exterior steel balustrades combined with wood posts and/or handrails. This combination of wood and steel encompasses a wide variety of styles from industrial to what we’ve coined as mountain contemporary. The strength and durability of steel, especially when properly powder coated not only provides a strong durable foundation but is extremely versatile. The wood components enhance the aesthetic beauty while providing for typically larger handrails, richer more natural colors and a contrast that creates beautiful exterior railing systems. One of the difficulties faced in the past, though far from insurmountable, is the requirement of multiple trades to accomplish this look. This type of system often requires a timber company, steel fabricator and a trim carpenter in addition to the paint and/or powder coat contractor. Titan Architectural Products, Titan Stairs, has long worked in each of these often separate trades. While in the past our different divisions have been largely separate on individual projects, this division is proving to be less and less common. 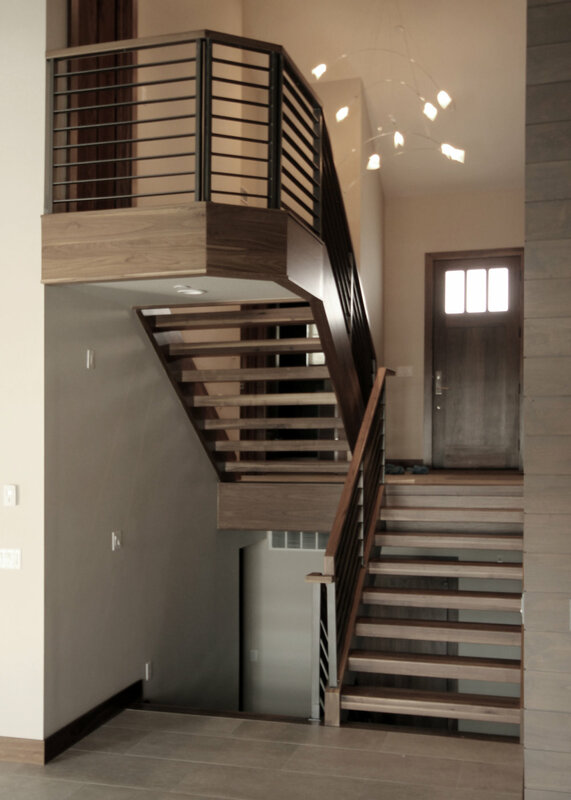 Instead we’ve been able to fabricate and powder coat steel stairs and railings with our craftsmen adding the final woodworking details to finish the project. These are not typical wood and iron baluster combinations where iron balusters are installed into a wood rail and base shoe (such as is typical of many interior railing systems) but instead are fully fabricated steel stair structures and railing systems combined with wood posts, handrail, subrails, etc. Here are some examples of steel and wood combinations in both interior and exterior applications.